Your workers have a unified purpose. Why stop there? Let that unity flow through in your office design. Outfit your office today with an integrated Voi design from The HON Company. HON Voi offers unified desk and storage solution for every application - benching, private offices, semi-private offices, open plans, and more. Want to encourage collaboration, yet lend a sense of personal space with your office design? Benching is perfect for you! 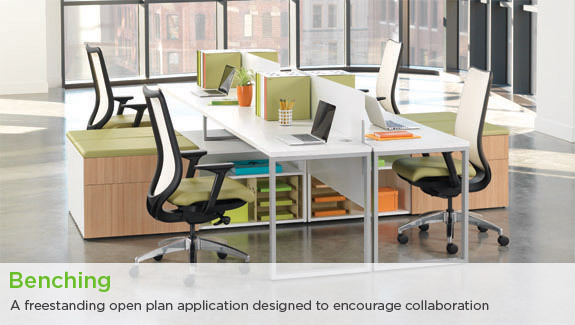 Benching stations offer freestanding styles with open plans for collaboration while privacy screens and a wide range of storage solutions enhance the feeling of personal space. Looking for a workspace solution for visitors, contractors, or those with no assigned workspace? Voi's compact touchdown stations provide that short-term worksurface with added storage, yet conserve floor space making them the perfect solution for you.